The winner of Sunday’s contest will have a delicate task in balancing an appeal to the broad center of French voters, while not allowing other political movements steal support on the UMP’s right. Marine Le Pen, who won nearly 18% of the first-round vote of the presidential election in April 2012 will almost certainly try to make a bid to expand her appeal beyond the narrow confines of the far-right Front national and become the strongest candidate of the French right in 2017. Despite Fillon’s apparent lead, Copé has a coterie of strong supporters, including Chirac’s prime minister from 2002 to 2005, Jean-Pierre Raffarin — Copé served as Raffarin’s spokesman for much of that time. Outspoken social conservative Nadine Morano, who lost her seat in the Assemblée nationale after June’s legislative elections, also supports Copé. Perplexingly, moderate former prime minister Dominique de Villepin, who served from 2005 to 2007, and himself a famous rival of Sarkozy, supports Copé and in so doing, seemed to downplay Copé’s far-right tendencies in favor of the need for generational change within the UMP. De Villepin himself failed to qualify for the ballot when he ran for president earlier this year. While Sarkozy himself has had critical words for Fillon, he’s had markedly less criticism for Copé, despite the fact that Copé himself was once a Sarkozy rival. 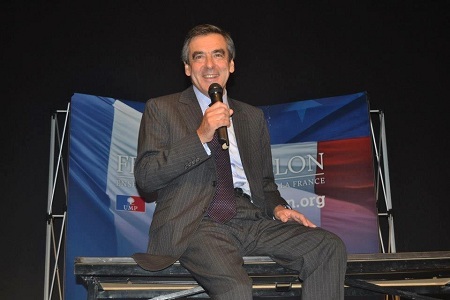 Fillon counts among his supporters many of the members of his former government, including rising stars such as Xavier Bertrand, former minister of labour, employment and health, as well as senior figures of the French center-right such as former prime minister Édouard Balladur and former Paris mayor Jean Tiberi, who’s close to former president Jacques Chirac. Sarkozy’s former longtime chief of staff and minister of the interior from 2011 to 2012, Claude Guéant, supports Fillon as well. So while Sunday’s vote is important, and although Hollande’s popularity has rapidly slipped since his election as president in May, no one should get too carried away that the French right is settling on a presidential candidate for a race that’s so far away. Other figures, such as Bertrand or former environment minister Nathalie Kosciusko-Morizet, Sarkozy’s spokesperson during the presidential campaign, who failed to win the 8,000 supporters in time to qualify for the UMP race on Sunday, may be waiting in the wings hoping to emerge as the candidate in 2017. Furthermore, de Villepin or even former prime minister and, more recently, foreign minister Alain Juppé, who declined to run for the UMP post, may also be considering a comeback. Previous PostFirst Past the Post: November 15Next PostFifth Generation: Who is Xi Jinping?